It’s been almost a month since I’ve been back from the East and I’m still adjusting to Canadian life, especially hometown life. I’m finding that living in a different city without four roommates is weird. Especially after coming home from a month where alone time was hard to find. I’ve mostly been on Facebook and either watching CNN, The World Cup or Orange Is The New Black. I got a new phone which doesn’t help either. I also have negative dollars in the bank so I can no longer chill in a coffee shop or see a movie. Poor me, right. Sure, I’ve seen some friends here, but only if they invite me out. I can’t find the energy to have anyone over. Let’s look at the three TV shows. I watch CNN because I feel the need to make sure my Palestinian and Israeli friends are okay. I watch the World Cup so I can keep up with my friends in Israel who inspired me to watch (Ja Deutschland!) and because I want to tell my baby sister that I’m watching the country she’s in at the moment. The third, OITNB, I watch because it’s addicting and I need something to fill my time. In other words, please call back later, Sarah’s not here right now. My friend in Ramallah has found that his friends are busy nowadays and he is also bored. We can relate! Soooo he decided to teach himself Hebrew (an amazing gesture from a Palestinian) and I’ve decided to read or paint. He has already memorized the Hebrew alphabet, which is really impressive. Tonight I decided to make hummus and pita from scratch. Either Ktown has no places that sell Tahini, or I just didn’t know what it looked like because it took 3 stores to find the gem of a sauce. I also made time to paint a photo I took in Jerusalem. Although it’s not a language, painting is still a form of communication. 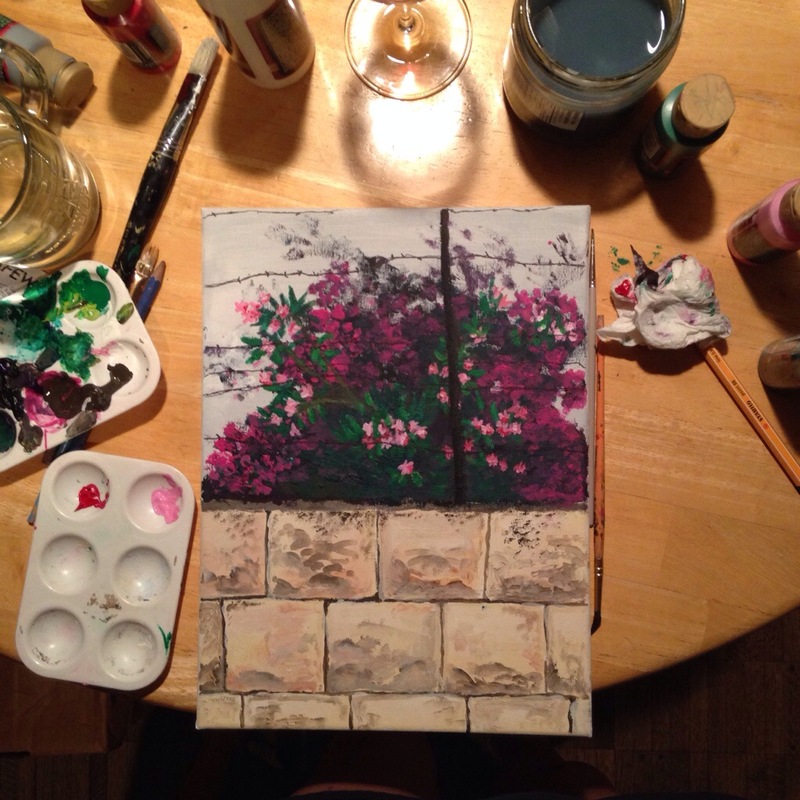 To me, the picture is showing how beautiful creations like pink oleanders can still be alive and free, even behind an ugly fence. Walls symbolize much more to me now, they’re not just a physical barrier. 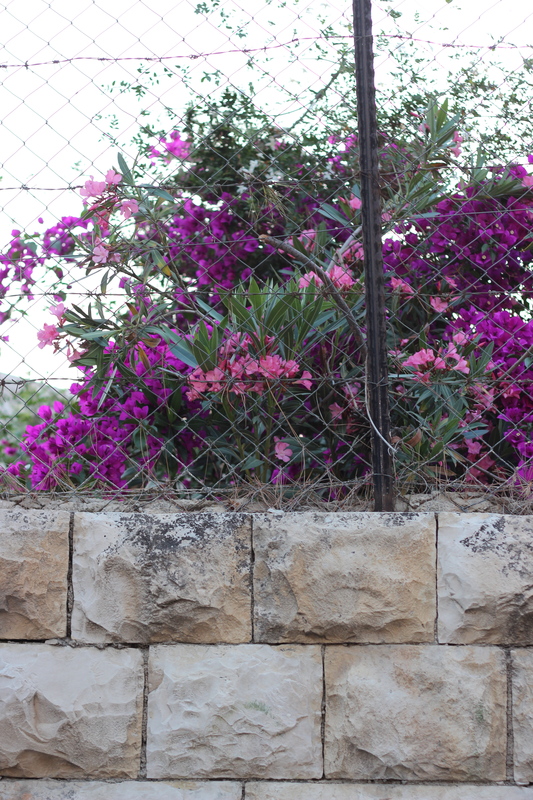 Also, we have an oleander tree at my house, so when I saw them wild in the Holy Land, I got pretty excited. * = Noushkourallah, probably spelled wrong, is my favourite saying (next to ‘yalla’). It means ‘thanks be to God’ in Arabic.